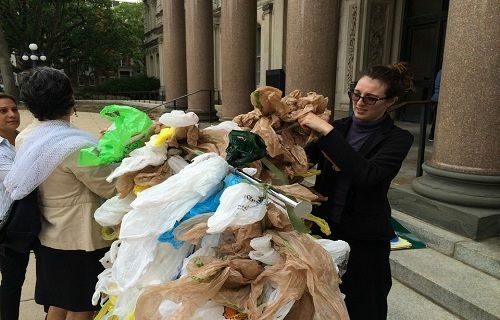 The Princeton Merchants Association has announced a new initiative to collect plastic bags, which will be used in the manufacture of weatherproof decking and other products. TRENTON (Scrap Monster): The Princeton Merchants Association (PMA) in partnership with town authorities, businesses and nonprofits will collect plastic bags for recycling. As part of the new initiative, the Association plans to add 10 new containers in addition to the existing ones at the McCaffrey’s and the Princeton University Store. The new containers will be located at convenient and busy locations across the town. The Association intends to conduct a campaign to encourage people to drop off their bags. The containers can be used to deposit variety of bags including plastic shopping bags as well as newspaper bags, bread bags, food storage bags and other plastic film such as dry-cleaning bags. The bags thus collected will be received by Trex Recycling, where they will be recycled to be made use in the manufacture of weatherproof decking and other products. According to the Association, charging fees on bags may discourage its use, but will not take care of recycling part of it. It further believes that educating the general public and providing easy-to-access containers across the town to collect bags are equally important to curb consumption. PMA, headed by John Marshall, aims to assist local businesses in achieving their business goals by developing and accessing educational programs, collaborative marketing opportunities, and effective communication tools. Trex Recycling is the world’s largest manufacturer of wood-alternative decking products. Trex combines the durability of recycled plastic with the natural beauty of reclaimed wood to produce variety of outdoor applications.